It's been a stressful week in the United States, capping a long and divisive election cycle. One aspect of my personality is that it's very easy for me to soak up other people's worries, fears, stresses and add them to my own. "In our always-on, always-connected world of television, social media, and on-demand everything, it can be stupidly easy to spend your entire day consuming information and simply responding to all of the inputs that bombard your life. This week theDiva challenged us to use CZT Nadine Roller's tangle Eaxy. I chose to pair that high-focus, geometric pattern with the curvy, flowing lines of l'Eaura by CZT Ria Matheussen. I sometimes find it hard to blend straight line tangles with more organic ones, but I really enjoy the contrast that this combination creates. 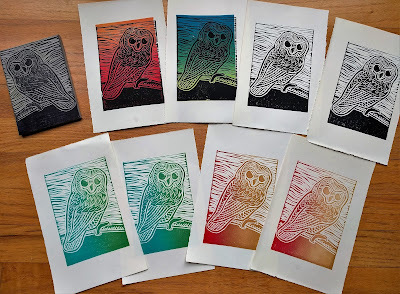 A bunch of new art opportunities have opened up for me lately, one of which was a night out with a very dear friend to take a printmaking class at artEAST Art Center and Gallery. 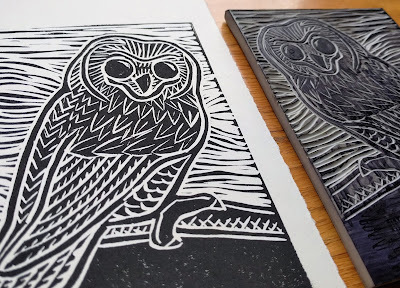 My Zentangle practice got a chance to cross-over to this new-to-me media as I carved simple repetitive marks to indicate the texture of owl feathers on this printing block. On the right, the block I carved with an owl on a branch. On the left, a print I pulled from the block using black ink on white paper. In the class we printed our newly carved blocks multiple times and using different colors of ink, making several small editions. A variety of block-printing ink colors allows for lots of printing options. It's hard to choose, but I think maybe this one is my favorite. Huge thanks to a wonderful artist and teacher, Leslie Nan Moon! A strange week for sure. You've handled Eaxy very well - I couldn't tame it. I know what you mean about the mix of straight and rounded tangles - but when it works it looks great. 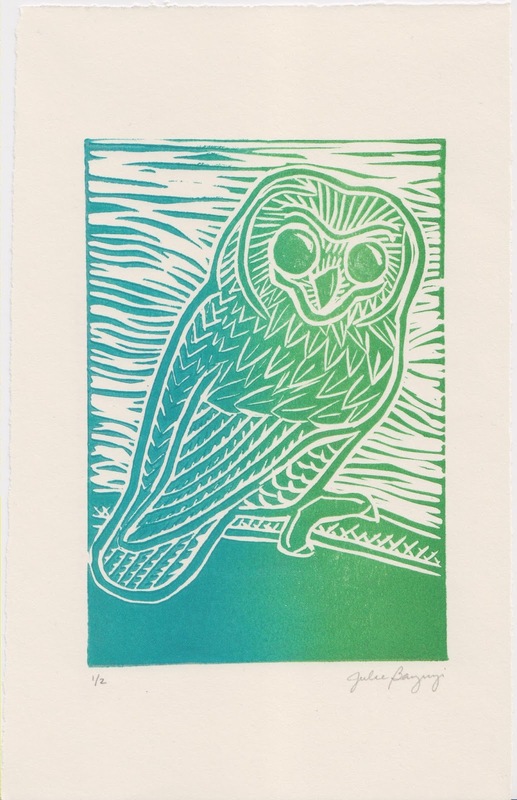 Love your owls - and that looks incredible for your first attempt! Both tiles are beautiful and (this difficult) Eaxy done so very well. I love those owls, the sign for wisdom the world needs. Thank you for the wonderful words you have written in the item:"create an outgoing signal" It is so true!!! 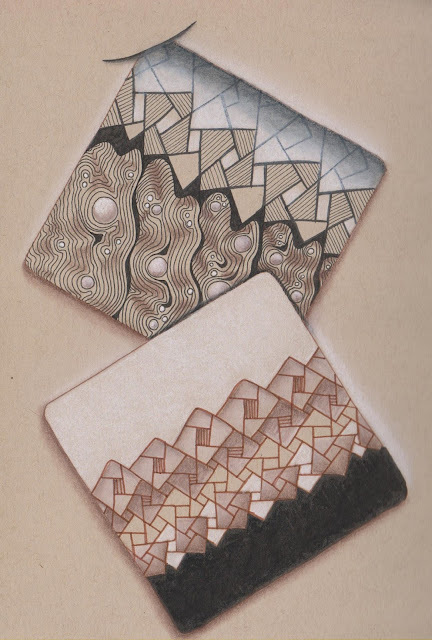 To combine a geometric pattern with a more curvy, fluent one is always nice and I am very proud that you have chosen L'Eaura for this challenge.It looks beautiful the way you have drawn it. I love your owls. At night, sometimes I can hear them in the woods around us and that makes me always happy. I can so relate with your frustration over the past week in the US. I tend to soak up others reactions as well. We all need to unplug and take time out for something creative and worthwhile to re-center ourselves. Your tiles are fabulous and the one that you combined with L'Eaura really showed a beautiful transition from the high focus Eaxy to the flowing lines of L'Eaura. What a wonderful way to combine them. Your owls are absolutely amazing...I have a collection of owl figurines that people I worked with brought me from their travels because I love owls. I'm fond of saying that they are my favorite people. I love your carving and the prints turned out beautifully. 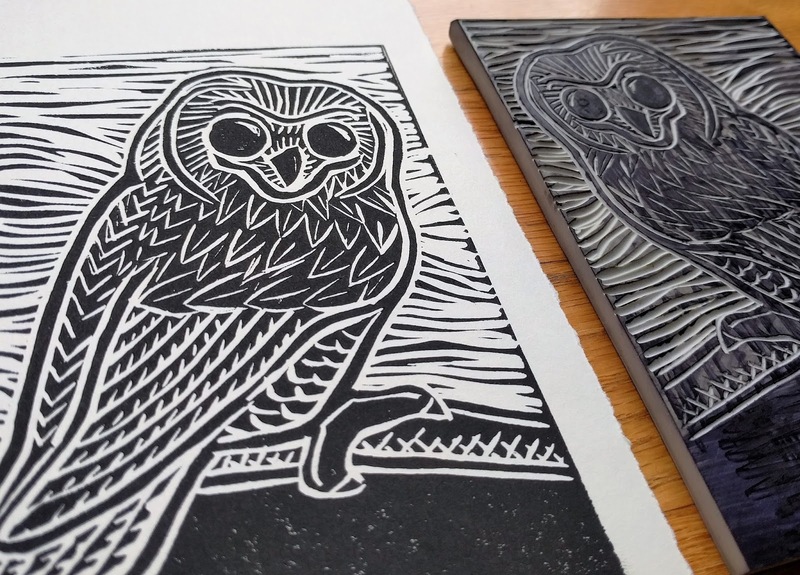 I hope that you can continue in printmaking, it seems to suit you as well as zentangle. Have a great new upcoming week. Thank you so much for your kind words, LezliB. 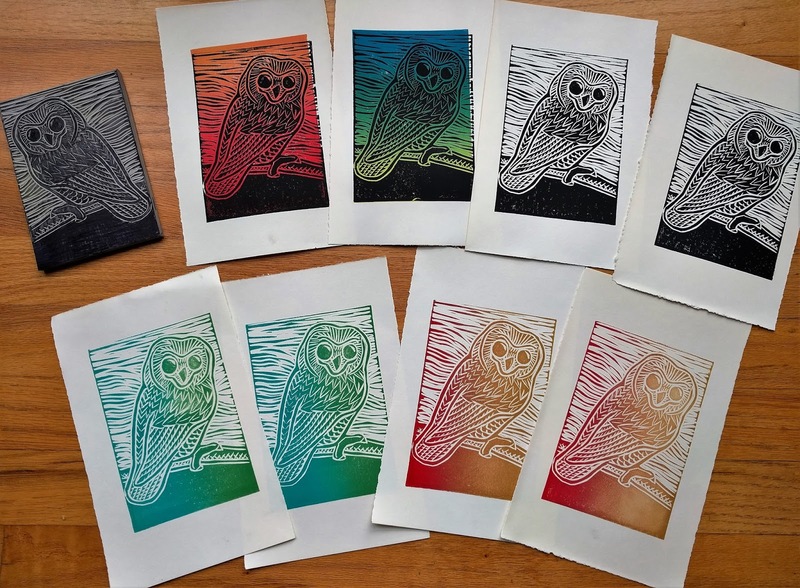 I had a great printmaking teacher at the workshop who really helped each student be successful. I definitely want to do more of it. Carving the design was very meditative like Zentangle and then pulling the inked prints was a very satisfying experience!